Rockstar is dressing up their latest in-game Grand Theft Auto Online offering in a realistic premise. As announced on Tuesday alongside the DLC release, players are being given an in-game boost, in the form of digital currency, to help fund their criminal exploits in the virtual world of Los Santos and Blaine County. This isn’t the first time GTA Online players have been treated to some kind of cash stimulus, but this is the first time we’re seeing another kind of in-game promotion. Styled as a tax return, everyone who logs into GTA Online between the 16th of February (ie today) and the 26th will receive an in-game bonus of GTA$ 250,000. This means you have ten days to be in on the goods. Somehow every time there is such a promotion, everyone keeps forgetting (or not reading) that you won’t get the cash instantly, and that instead it will be handed out sometime after the deadline – in this case, between the 27th of February and the 6th of March. No sooner. While GTA$ 250,000 doesn’t get you much these days, players shouldn’t look the gift money in the digit, and it can still get you some older, cheaper content you missed out on, or be added to your fund if you’re saving up for something big. Incidentally, now is a good time for some large investments if you’ve been holding off on spending big, due to the other promo Rockstar initiated. In an ongoing 10% “tax refund”, lasting from the 16th to the 26th, everytime you spend GTA$, ten percent of what you pay will be given back to you when the bonus GTA$ 250,000 is handed out. 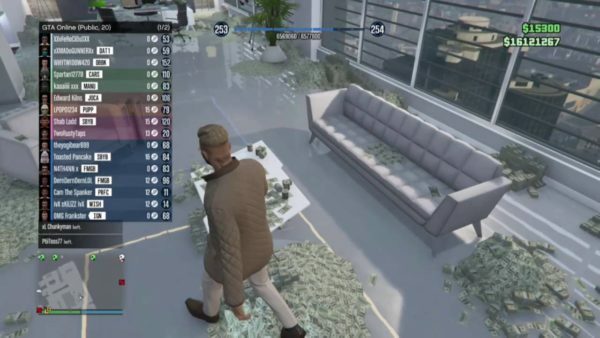 These rebates stack, so if you make multiple purchases during the period, all of those ten percents will add up with a maximum limit of GTA$ 1,000,000. If you spend big, you stand to get a max payout of GTA$ 1,250,000 (including the free GTA$ 250K) when the time comes after the 27th. Of course, this requires you to spend a lot of in game cash – GTA$ 10 million – and most players probably don’t have enough saved up and are looking to buy that much stuff to max this bonus out. Nonetheless, this is a rather novel game promo concept the likes of which we haven’t really encountered in other titles. Kudos to the team at Rockstar for thinking of new ways to give back to the playerbase. Remember to log in by the 26th of February to secure your reward.